NextDayScience offers veterinary scales for both large and small animals, depending on the needs of your practice. 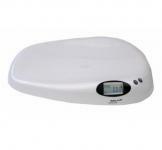 The CPW-plus models are multi-purpose industrial scales designed for easy use. Featuring different options for units of measurement, an easy to read backlit indicator, and portability, the CPW-plus scales are dependable and durable. The MXB Veterinarian Scale offers fast and reliable weighing for small animals. The smooth contours has secure support for small animals, and the simple operation makes using and learning the scale hassle free.